ASTM D638 is the most common testing standard for determining the tensile properties of reinforced and non-reinforced plastics. With the use of plastics being at an all-time high, it is critical that manufacturers be able to properly gauge the mechanical strength of their materials. This guide is designed to introduce you to the basic elements of an ASTM D638 plastic tensile test, including an overview of the equipment, software, and samples needed. However, anyone planning to conduct ASTM D638 testing should not consider this guide an adequate substitute for reading the full standard. Tensile strength – the amount of force that can be applied to a plastic before it yields (stretches irreparably) or breaks. Is ASTM D638 the Right Standard for You? There are many different test methods for various types of plastics. ASTM D638 only applies to rigid plastic samples between 1.00 mm and 14 mm in thickness. If your sample is a sheet or film less than 1.00 mm thick, please refer to ASTM D882. If you are testing an elastomer, please refer to ASTM D412. These methods and more can be found in Bluehill® Universal’s Applications Modules, which are pre-configured method templates for the most popular ASTM and ISO standards. There are five allowable specimen types for ASTM D638 which differ in size depending on the thickness of the specimen and the amount of material available. The most commonly used are Type I specimens, which are 3.2 mm thick and are generally created by injection molding. Type I specimens have an overall length of 165 mm and width of 13 mm, with a gauge length of 50 mm. Flat specimens are typically molded, die-cut, or machined into a “dogbone” or “dumbbell” shape, which ensures that the break occurs in the center of the specimen rather than at the clamping areas. In addition to flat specimens, ASTM D638 also allows for the testing of rigid tubes and rods, both of which must also be machined into a dogbone shape. In instances where material is limited, many labs will use Type IV or Type V specimens. The dimensions required for Type IV specimens are the same as those required for ASTM D412 die cut C, meaning that the same die cut can be used. Type V specimens are the smallest, with a gauge length of only 0.3 in. All specimens must be measured before testing in accordance with ASTM D5947. Most typical micrometers should be suitable for performing these measurements. For the test system to display Stress measurements rather than just Force measurements, operators will be asked to input the cross-sectional area (or thickness and width) of the specimen, because Stress = Force / Cross-Sectional Area (this is shown in units of Psi, Pa, kPa, GPa, etc). Die-cut or machined samples need to be measured individually, but operators using injection molded specimens only need to measure a single sample from a sample lot providing the variation in that sample lot is proven to be less than 1%. Injection molded specimens are often produced with a draft angle instead of being perfectly square, which must be taken into consideration when measuring the specimen. Always make sure that width measurements are taken at the center of the draft angle. The Automatic Specimen Measuring Device feature in Bluehill Universal allows operators to connect up to two micrometers or measurement devices to the computer and input the data directly into the software. This eliminates the chances of input errors and increases efficiency. 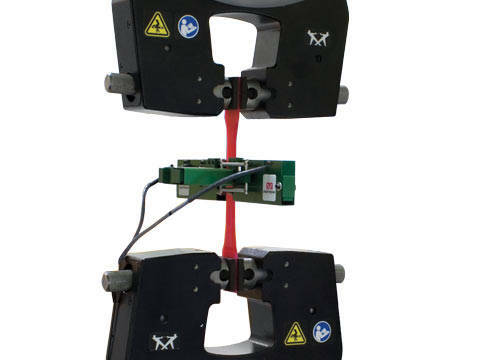 Most ASTM D638 testing is performed on a table top universal testing machine. A 5 kN or 10 kN (1125 or 2250 lbf) system is most common, but as reinforced plastics and composites increase in strength, higher capacity units – such as 30 kN or 50 kN systems - may be required. It is important that specimens are held securely inside of the tensile machine. Side action pneumatic grips with serrated jaw faces are often the best grips for holding rigid plastics. With pneumatic grips, the gripping force is maintained by air pressure, which remains constant even if the specimen thickness changes significantly during the test. For forces above 10 kN, typically only found with reinforced materials, manual wedge action grips are preferred. In order to test properly, specimens must be held perpendicular to the jaw faces and not tilted on an angle. Specimen misalignment can cause major variations in results, and proper care should be taken to ensure that the specimens are all aligned consistently for each test. One way of addressing misalignment is by using a jaw face that is close to the same width as your specimen, making it relatively easy to visually adjust alignment. But the easiest way to prevent misalignment is to use a specimen alignment device which mounts directly onto the grip bodies. This is a simple bar that provides an adjustable stopping point so operators can easily tell that their specimen has been aligned correctly. When the grips are tightened onto the plastic specimens in preparation for running a test, unwanted compressive forces are frequently applied. These forces, although minute, can interfere with test results if not treated properly: It is important that they not be balanced after the specimen is inserted, as this will cause an offset in results. Bluehill Universal software can be programmed to normalize forces across multiple specimens and remove any slack or compressive force, ensuring consistent results between specimens. On the 5900 Series universal testing machines, we also recommend the use of Specimen Protect, which is designed to prevent damage to the specimen or system during the set-up phase of a test, before a test’s operational limits are defined. When turned on, Specimen Protect automatically adjusts the crosshead to keep any unwanted forces under a certain limit. Watch this video to learn more about Specimen Protect. Modulus of elasticity – how much the specimen stretches or deforms in response to tensile force - is one of the most important types of data gathered by ASTM D638 plastic tensile testing. Users need an appropriate strain measuring device – an extensometer - to gather this data. Extensometers for measuring modulus must comply with ASTM E83 Class B-2. Several extensometer options are available depending on the needs of your laboratory. The simplest type is a fixed-gauge length 2630 series clip-on extensometer. An operator must clip this directly onto the specimen at the beginning of each test and remove it after the specimen yields or before the specimen breaks. The AutoX750 is an extensometer that automatically attaches to the specimen without interference by the test operator. This is useful in labs that have high throughput needs, as it eliminates the time-consuming need for manual manipulation by the operator, and also provides more consistent placement on a large number of specimens. Consistent placement results in more repeatable modulus values. If testing to other standards, such as ASTM D790, automatic extensometers also provide the flexibility of using different gauge lengths with a single device. Oftentimes, the plastics being tested are ultimately destined to be used under non-ambient conditions. To simulate these end-use applications, ASTM D638 is performed inside a temperature chamber where heating or cooling (LN2 or CO2) can be used. In these instances, a non-contacting Advanced Video Extensometer (AVE2) is the recommended option. The AVE 2 allows modulus data to be gathered without the test operator opening and closing the chamber and causing temperature fluctuations during the test. When presenting test results, it is important to ensure that the terms are properly defined in order to ensure compliance with the standard and facilitate data comparison between different laboratories. The most common mistake in data reporting is to report strain values using an incorrect source (extensometer instead of crosshead) which can lead to drastically different results. Plastics testing standards refer to a term called nominal strain which is defined differently depending on which test method is being used. For ASTM D638, nominal strain is defined as the strain measured from the crosshead displacement, not from the extensometer. This is because plastic does not break down homogenously, and strain is often focused on a disproportionately small part of the sample, a property called “necking”. For any materials that neck or have a yield point, percent elongation at break cannot be reported via the extensometer, as necking may occur outside of the extensometer’s gauge length. Therefore nominal strain must be used to report percent elongation at any points after yield. Using an extensometer for strain at break is only acceptable if the strain is homogenous throughout the specimen and doesn’t exhibit necking or yield. Plastics which exhibit different behaviors may require the use of different modulus calculations to appropriately capture the elastic portion of the test. Most modern testing software allows for the customization of modulus calculations. Understanding how the modulus is being calculated is critical to ensuring consistency in results. For a material that doesn’t exhibit a true linear portion, a secant modulus is typically recommended, creating a modulus line between zero and any user-defined point on the curve. Segment modulus calculations form a best-fit line between a specified start and end point and performs a least-squares fit. Most commonly, a Young’s modulus calculation is used, determining the slope over a number of regions and reporting the steepest slope via a least-squares fit. Bluehill Universal allows users to either define a number of regions or use the Automatic Young’s Modulus calculation.